Who doesn’t love dinosaurs? And who doesn’t love Lego? What about something that combined dinosaurs and Lego? Well, you get the Lego Jurassic World range that is perfect for fans of the original franchise, as well as those who have been struck by the wonderment of the Jurassic World movies. This range has a heap of excellent sets that drag you right onto Isla Nublar among all the thrashing, gnashing and crashing, while you’re there, you may as well check out our choices for the best Lego Jurassic World sets, but keep an eye out for raptors. 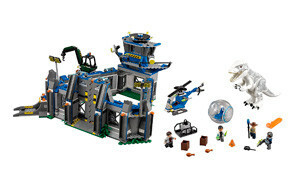 Our top choice for the best of the best Lego Jurassic World set is Blue’s Helicopter Pursuit. Fans of the movie will revel in being able to recreate adventures seen in the reboots as well as create scenes conjured straight from their own imagination. The set comes with a helicopter that features spinnable blades to zoom through the air, as well as a working stud shooter to fire at that dastardly Wheatley as he attempts to steal away your beloved Lego raptor. To make the chase more dramatic, there is a quad bike for Wheatley to attempt to make his escape, but we all know that’s not how this story ends. Blue’s Helicopter Pursuit is an excellent, fun set that is packed full of detail that transforms it from any old kit into something greater. The dinosaur cage does much more than you would expect and the substantial helicopter comes with a windable hook to pick up items along the way. In terms of price per piece and enjoyment, this set is going to be difficult to beat. Be sure to also check out our list of the best Gundam model kits for more great items like this. This massive Indoraptor Rampage set comes packed full of surprises as your mini-figures do their hardest to outwit each other and the ferocious Indoraptor that is quite literally snapping at their heels (or whatever Lego figures have). Inside, there are tons of secrets to be found throughout. These include removable windows for the raptor to stick their ugly (or cute, depending on how you feel) heads through in search of fresh meat, uh… plastic, we guess. But don’t be too scared, there are a few hiding places throughout to keep your minifigs safe and the motorcycle allows for a speedy getaway once you’ve outsmarted this marauding reptile. On top of being a bricking good time to play with, it is also a great gift for those who just love dinosaurs and all things Jurassic (or Triassic, or Cretaceous, basically anything before we came stomping in and ruined the place). You may also like our selection of best Lego Minecraft sets so check it out. Estate features museum, laboratory, office and more! If this set teaches us anything, it is that is it not advised to piss off mama. Luckily, the gyrosphere helps make for a speedy getaway that can take you over wide open plains or through the humid depths of the jungle. For extra thrilling speeds, use the launcher to make a quick escape, just look out for any trees that might jump into your way. Bringing up the rear and trying desperately to evade the Carnotaurus is the mobile control center cab with stud shooter. There are also 3 mini-figures including an Owen design that is exclusive to this set. If you like to collect every minifig you can, then this is a massive bonus, as you’ll get a quality set, along with something unique. The Gyrosphere Escape is a fun and engaging build that will easily kill a few hours over the weekend and has the potential to recreate one of the Jurassic World’s most nail-biting scenes, even if we all know how Hollywood works. Maybe next time you’ll learn to leave those dino eggs alone, right? Our handy guide to the best Lego architecture sets features more great products like this. For the best value set, we’ve chosen the Lego Juniors Raptor Rescue Truck. 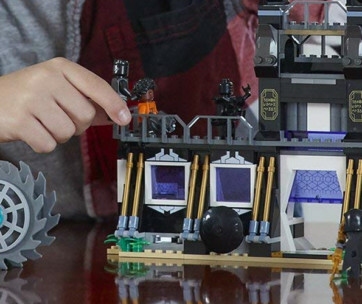 This set is designed primarily for kids just getting into Lego, and so contains fewer pieces and much simpler instructions, but that doesn’t mean there still isn’t fun and adventure to be had. 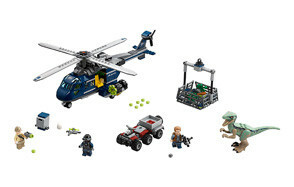 The set comes with a buildable Lego Jurassic World raptor that can be posed and manipulated to scare or save Owen from enemies. The off-road truck is simple to build, and the set is supplied with fun little accessories to drag you into the Jurassic World by its jaws and never let go. It is a great little starter kit for your younger kids who love both Lego and dinosaurs, which makes it the perfect setting to allow them to play all of their Lego dinosaur games to their heart’s content. It might seem a simple build, but what it lacks in complexity, it makes up for in charm and unbridled joy as your kid realizes their love for all things Lego. Love Lego products? Check out our review of the top Lego city sets for our top picks. Our Premium Choice for the absolute best Lego Jurassic World set is the Indominus Rex Breakout Building Kit. Containing nearly 1200 pieces, it is the largest set in this list, and the most expensive, but when you see what it has to offer, you will realize it is more than worth it. In this set, your mini-figures are tasked with pursuing the terrifying, massive and dangerous Indominus Rex using helicopter or gyrosphere and try to return it to the impound, all the while hoping you make it out alive. The set also comes with a plethora of accessories that fully immerses you in the Jurassic universe. This set is versatile enough to re-enact scenes from the movies or use your imagination to create brand new, thrilling chases that only you could concoct. However you want to use this set, whether it is play or display, you will feel like it is a worthy addition to any Lego set collection. If you can afford it (or give in to your kid’s endless begging), the Lego Jurassic World Indominus Rex Breakout set is a comprehensive set that will keep you engaged throughout. Find more great products like this by checking out our guide to the best Lego Ninjago sets. Featuring a dinosaur that gave a generation of kids herpetophobia, the Dilophosaurus Ambush Building Kit brings all those nightmares to a whole new batch of kids (and back to you too, sorry guys). But we’ll forgive Lego this time, how can we stay mad at them anyway? This set is great fun for younger builders if perhaps being a little too simple for experienced Lego fans. The gyrosphere is fun and fast, making it the perfect ally to escape that dreaded Dilophosaurus safely and the authentically decorated 4×4 that comes with it is designed the handle the most extreme off-road environments. When you get close enough, you can use the front-winch on the car to capture the dino and haul it to safety. The Dilophosaurus Ambush is an enjoyable medium sized kit that will provide endless hours of thrilling excitement as you and your kid strive to escape the scariest dinosaur in the park and evade its quick-snapping jaws, or you might just end up being the tastiest treat in the entire Jurassic World. 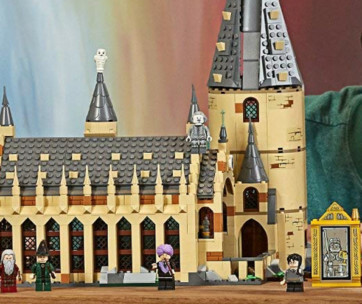 Don’t forget to also check our Harry Potter Lego sets. The T-Rex Transport set gives you the chance to show compassion to these gigantic murder machines (that are really just misunderstood), and help save their lives. Using the transport truck, you can hold the mighty T-Rex safely inside a containment unit and carry it for its crucial blood transfusion at the medical unit. 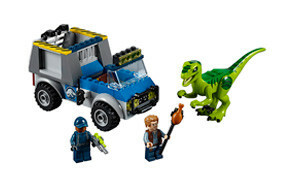 Designed with moveable parts including a poseable T-Rex and shifting doors on the side of the truck, you will get more autonomy with this than other sets in the Jurassic World Lego range. You also get three mini-figures to expand your collection and further build your very own Jurassic World all in your living room that is looking more and more like prehistoric jungle every day. This set has proven to be a must-have Lego set that is designed to be heaps of fun and will provide hours of entertainment. The construction is challenging but enjoyable, the build mechanics are strong and innovative, the mini-figures add excellent splashes of character, and the T-Rex lives up to its name by standing 4 minifigs tall, making it an imposing figure large enough to cast a shadow over even the bravest little Lego dude. For more great Lego gifts, check out our Batman Lego sets reviews. These dinosaurs sure do love breaking out their enclosures, don’t they? Why can’t the guards just let them roam free? Well, if they did there wouldn’t be all that many sets to make, and probably not many mini-figures left, either. Bringing mayhem to the lab, your mini-figures will have their hands full as they desperately try to contain the wily and cunning Stygimoloch from getting away. The set comes with breakable doors that ‘Stiggy’ can burst through in a bid for freedom, with Dr. Wu and his guard not far behind, which is better than cowering in the corner, we guess. It isn’t the largest or most complex set that you can find, but there is still potential for lots of enjoyment from this small Lego set that might just surprise you. Stiggy comes in six different parts, so you can enjoy putting him together (before he makes his escape), and, more interestingly, the barriers can connect with other Lego Jurassic World sets, giving you the opportunity to expand your world like never before. Our guide to best Star Wars Lego sets offers more great items like this so check it out. It’s that pesky Dilophosaurus again! This Lego Jurassic World set forces you to confront your childhood fears and take on the Dilophosaurus with the help of 3 different mini-figures as you fend off her attack and try desperately to get her to return to her cage. 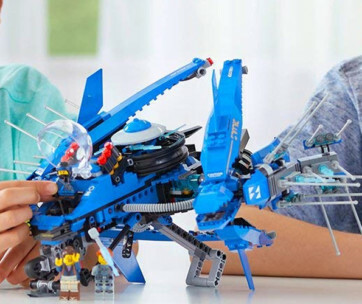 Even at fewer than 300 pieces, this is still a set that will take some time, as there are a number of intricate connections that could present a challenge to even experienced builders. It is also full of surprises, offering multiple different ways for the dino to break out that will be sure to keep you on your toes. For even more excitement, you can combine this set with the Stygimoloch Breakout set for maximum panic, and also give your guards a chance to earn their paycheck. For people who love the thrill of causing havoc and mayhem in their park, this is the set that will provide endless joy for you, but maybe not so much for your mini-figures. After you treat your kid, you may also want to treat yourself with one of the products from our Lego sets for adults list. Disaster has struck and you need to ensure that all the dinosaurs on the island are safe and sound, but some of them just won’t listen. This 126 piece set is a relaxing afternoon build that lets you explore something a little different in the world of Lego. Providing a totally different build compared to other Lego Jurassic World dinosaurs, the Pteranodon is a crucial addition for any collection, while the net launcher is a piece of Lego genius that you do not see everyday. For the AFOLs out there, you’ll be wondering where all this brilliant engineering was when you were a kid, it doesn’t seem fair, but at least it is around now. It may be a small set, but Pteranodon Chase is still a solid if slightly simple kit that would feel at home in even the vastest Lego collection. The car comes with helpful storage compartments, and the minifigures make it ideal for acting out all your favorite scenes, real or imagined.